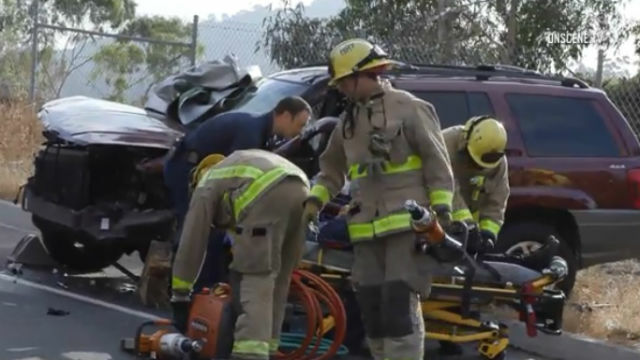 Two motorists suffered major injuries Tuesday in a head-on collision in La Mesa, police said. Photo via OnScene.TV. A head-on collision possibly caused by distracted driving fatally injured a motorist on an East County street Tuesday, authorities reported. The 40-year-old man was headed west in the 4100 block of Riviera Drive in La Mesa when his 1998 Toyota Camry veered into an eastbound lane for unknown reasons and crashed into an oncoming 2000 Jeep Cherokee about 7:40 a.m., according to La Mesa police. Medics took him to a trauma center, where he was pronounced dead. His name was withheld pending family notification. The driver of the Jeep, a 33-year-old woman, was treated at a hospital for minor injuries, Lt. Brian Stoney said. Neither speeding nor intoxication was believed to have played a role in the wreck, according to police. “There is some evidence to suggest that distracted driving may have been a factor,” the lieutenant said. He did not elaborate. Updated at 6 p.m. Aug. 14, 2018.